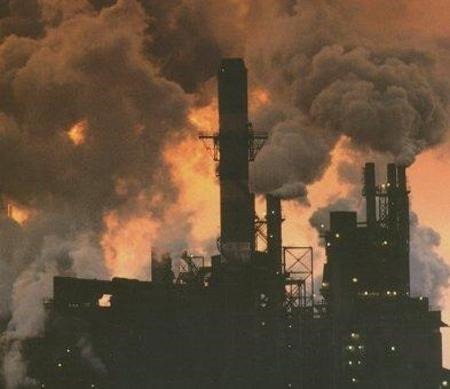 The newspaper said that the report emphasizes that the impacts of climate change will only get worse unless nations agree to dramatic cuts in soaring levels of CO2 and other greenhouse gases. According to Reuters, the 40-page synthesis, sums up 5,000 pages of work by 800 scientists already published since September 2013. It said global warming was now causing more heat extremes, downpours, acidifying the oceans and is pushing up sea levels. Overall, The IPCC report expresses with greater certainty (press release) than in previous assessments the fact that emissions of greenhouse gases and other anthropogenic drivers have been the dominant cause of observed warming since the mid-20th century. An overwhelming majority of Americans believes the United States must take advantage of all low-carbon electricity sources, and a plurality identifies nuclear energy as the leading source of carbon-free power, a new national public opinion poll shows. Eighty-two percent of those surveyed agree (51 percent strongly so) with the statement, “We should take advantage of all low-carbon energy sources, including nuclear, hydro and renewable energy, to produce the electricity we need while limiting greenhouse gas emissions.” Carbon dioxide is the leading greenhouse gas linked to the threat of global climate change. When given a list of low-carbon energy sources and asked which ones provide the most electricity in the United States, 33 percent of those surveyed put nuclear at the top of the list followed by hydropower (30 percent), solar (15 percent), wind (9 percent) and geothermal (5 percent). “Americans recognize nuclear energy’s leading role as a low-carbon emitting source of electricity that is affordable and reliable, an attractive combination to the consumer,” said Ann Bisconti, president of Bisconti Research Inc.
Bisconti’s firm, along with Quest Global Research, conducted the survey for the Nuclear Energy Institute from Sept. 18 to Oct. 4. In fact, 75 percent said nuclear energy will be “very important” or “somewhat important” in meeting America’s future electricity needs. While nuclear energy accurately is identified as the low-carbon energy source that provides the most U.S. electricity, the poll also shows that awareness of nuclear energy’s clean air status could be substantially higher, Bisconti said. Nuclear energy is the nation’s leading low-carbon source of electricity, producing 63 percent of the power supplied by low-carbon sources. Looking ahead 15 years at which low-carbon sources will provide the most electricity, respondents said nuclear energy will lead the way with 32 percent followed by solar (29 percent), wind (16 percent), hydropower (12 percent) and geothermal (7 percent). Public support for nuclear energy continues to hold steady among a clear majority of Americans, the survey showed. Sixty-five percent of Americans favor nuclear energy “as one of the ways to provide electricity in the United States,” while 33 percent are opposed. 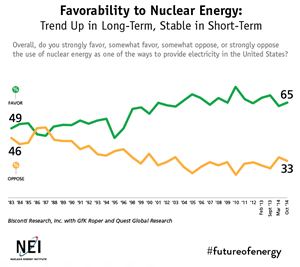 In a March national survey for NEI, 63 percent of respondents favored nuclear energy with 34 percent opposed. The nationally representative survey of U.S. adults interviewed by landline and cell phone has a margin of error of plus or minus three percentage points. Adults who associate nuclear energy “a lot” with reliability include 68 percent of those self-described as very well informed and 58 percent somewhat well informed on nuclear energy. In contrast, only 37 percent of those not too or not at all well informed have a positive view of nuclear energy. In general, in considering the electric sector as a whole, 95 percent of those surveyed said it is important to maintain a diversity of energy sources; 78 percent believe that energy diversity is “very” important. 83 percent agree that the federal government should develop a final repository for used fuel. This entry was posted in climate change, Nuclear. Bookmark the permalink.